A complementary feedingstuff for finishing and store cattle, dry cows, weanlings and bulls. Suitable for ad-lib feeding systems. Introduce gradually. Steam cooked maize and barley. Quality proteins and soya oil. 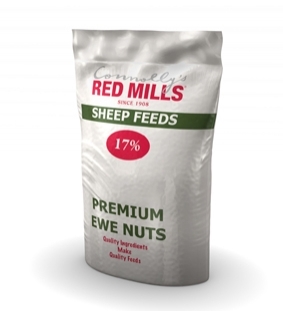 High quality muesli suitable for all categories of sheep. 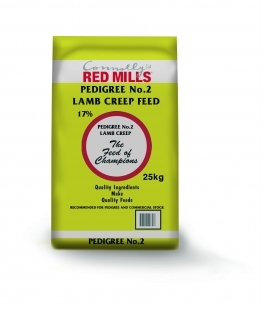 Recommended for pedigree and commercial lambs/hoggets/rams being intensively fed. Very popular and successful cooked feed, chosen by many top pedigree sheep breeders. Contains cooked soyabeans, peas, barley and maize. A cooked feedingstuff for finishing lambs/hoggets at grass, rams, also for ewes before and after lambing. All grain in this feed is steam-cooked and flaked. Contains a full complement of minerals, vitamins and trace elements. Steam cooked maize, barley and oats. Steam cooked peas, soyabeans and soya opil. Beet pulp and quality proteins. Consistent formulation intake and performance. 1 week to 4 months old. Balanced, palatable cube for less intensive beef systems. 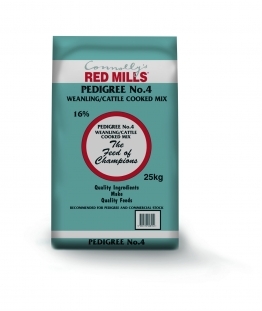 Ideal for stores, strong weanlings, heifers and cull cows. A cooked feedingstuff suitable for all categories of sheep. Recommended for lambs/hoggets/rams being intensively fed indoors/outdoors. Introduce at approximately 1 month of age. Steam cooked cereals and proteins. All produts packaged in convenient, durable polythene bags. 6mm cube for ewes before and after lambing. Does not contain calcined magnesite. Wheat and barley are main ingredients. To be fed with forage and water. 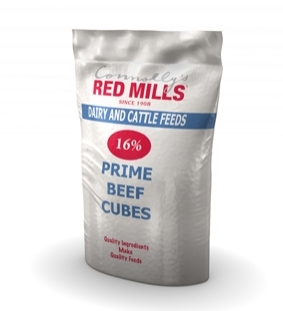 Grain based product - this feed is extremely popular. Recommended for high performance flocks or where body condition is below optimum. Calcinated magnesite is included - do not feed to male sheep. Contains by-pro (protected soya and mierals) as an excellent source of by-pass protein for milk production. 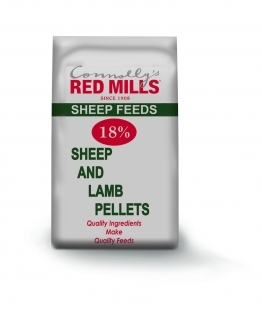 With Connolly’s RED MILLS you get quality animal feeds at the keenest prices. We have been supplying premium farm feeds since 1908, supported by the most modern technologically advanced plant and equipment. Check out our feed products for sheep, cattle, pigs and goats, as well as our chicken feed and other poultry and game feeds.